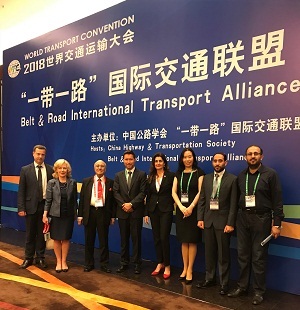 IRF (Geneva) was amongst the key stakeholders invited to attend the Belt & Road Transport Alliance (BRITA) preparatory meeting held in Beijing, China on 18 June. BRITA is a platform to enhance multi-level and wide-ranging cooperation between the countries along the Belt and Road. The meeting was held prior to the official opening of the World Transport Convention 2018 hosted by CHTS and officially supported by IRF (Geneva) for the second time. IRF (Geneva) has actively supported the shaping of BRITA and will be part of its Board of Directors. 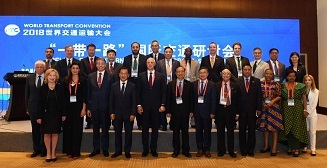 Hosted by the China Association for Science and Technology (CAST) and organised by China Highway and Transportation Society (CHTS) WTC had as theme “Better Transport, Better World” and attracted more than 1.000 papers from all over the world and roughly 5’000 delegates. Mr Kiran Kapila, IRF Chairman, delivered a keynote address in the opening ceremony which was inaugurated by the Minister of Transport of China, Mr Li together with Transport Ministers from South Sudan, Myanmar, Nigeria, Latvia, Nepal, and high-level delegations from several other countries. In his keynote Mr Kapila recalled the decades-long collaboration linking IRF (Geneva) and the Chinese Government and the special relationship with CHTS, an esteemed member of the Board. He also stressed that sustainable infrastructure is and should be at the heart of the BRI and called for mandatory road safety audits at all stages of road infrastructure development. Both the Minister and Vice-Minister of Transport of China put the accent in their interventions on the need to increase and improve the service level. They also referred to “durable infrastructure” and “integrated transport” as two of the key priorities of the government. Dignitaries from foreign countries illustrated their transport development plans and how they fit within the BRI. Some of the Ministers and Foreign dignitaries attended also the Belt & Road Transport Summit (BRITS) organised as part of WTC. Susanna Zammataro, IRF Director General, delivered a keynote presentation illustrating some fundamentals steps needed to create enabling frameworks to plan, design and finance sustainable transport infrastructure and sustainable roads in particular. Mrs Nancy Van Dycke, World Bank Manager in charge of the Sustainable Mobility for All initiative (SuM4All) rebounded on these concepts while illustrating the salient feature of this new initiative that federates 50 key transport organisations. IRF (Geneva) is actively involved in SuM4All and has recently been appointed member of its Steering Committee. While at WTC, Mrs Zammataro addressed also the Sustainable Urban Transport Summit with a presentation on “Mobility as a Service – MaaS”. The event provided to several IRF (Geneva) members present at the event the opportunity to present their work to an international audience and to network to find new business partners or simply exchange experience and expertise.